Pumpkin Is Back at Ruby's Diner! Pumpkin is Back at Ruby’s Diner for Fall 2018! At Ruby’s, we know when fall comes around it’s time to spice up our menu! Pumpkin menu items are back again and now available at participating Ruby’s Diner locations. These specialty fall items are available for a limited time only from September 10th, 2018 to November 30th, 2018, so be sure to try these fall favorites before they’re gone! Keep reading to take a peek at what pumpkin goodness we’ve got to offer guests this fall! Pumpkin and spice make everything nice! 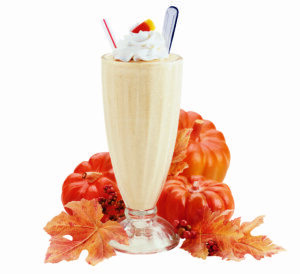 Our Pumpkin Delight Shake is a seasonal favorite, and we’re excited to bring this fall favorite back to our menus! This deliciously rich pumpkin shake is made with real pumpkin and topped with whipped cream and a candy corn for a festive garnish. The Pumpkin Delight Shake is our October Shake of the Month this year, but it will be available to order until November 30, 2018. Be sure to try it the next time you shooby dooby down to Ruby’s! These are for pumpkin lovers only! 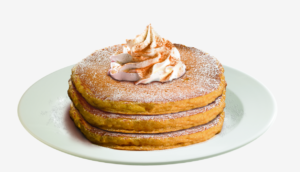 Our Pumpkin Hot Cakes are loaded with pumpkin and spice then griddled golden brown and sprinkled with cinnamon, nutmeg and powdered sugar. Stacked three hot cakes high and topped with a dollop of whipped cream, it’s one of the sweetest ways to start your day this fall season. This sweet breakfast also gets a serving of savory when you add two eggs any style and your choice of breakfast meat to complete your meal. Served until 11:30 AM at participating locations until November 30, 2018. Fresh off the waffle iron and smelling of fall spices, this delicious pumpkin twist on our crispy, light malted waffle is the seasonal sugar fix you need! 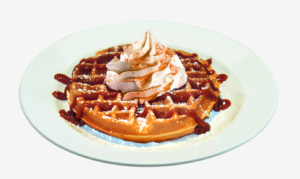 Our pumpkin waffle is topped with powdered sugar, cinnamon, nutmeg, whipped cream and caramel, then served with two eggs any style and your choice of breakfast meat to make it the perfect balance of sweet and savory. Try it with our Swingtime Coffee to start your day the Ruby’s way! Served until 11:30 AM at participating locations until November 30, 2018. Which Ruby’s Diner Locations Are Serving Our Pumpkin Menu Items? Want to see what else we’ve cooked up for you this fall season? See our other exciting promotions here!